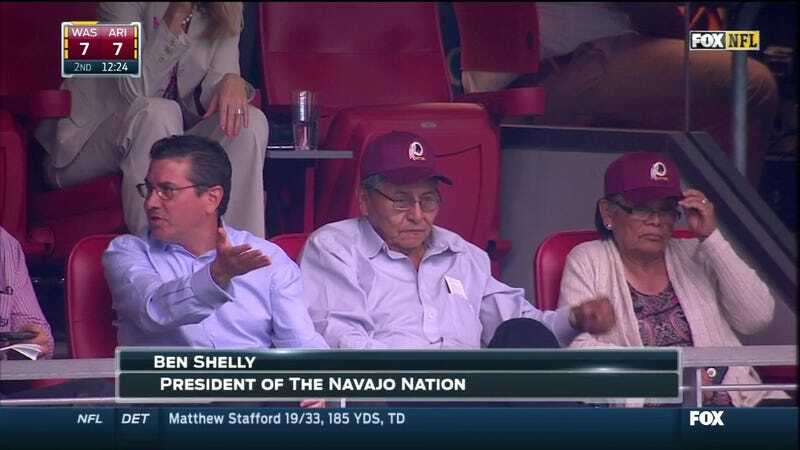 As part of his campaign to convince you that his team's name isn't racist, Dan Snyder took in today's game with Ben Shelly, president of the Navajo Nation. Once again, Dan probably should have done a little more research. So how did voters tire of Shelly after just one term? Shelly entered office under a dark cloud, being charged with fraud, conspiracy and theft in connection with allegations that he had dipped into slush funds to benefit himself and family members. The charges against Shelly were dropped in exchange for him agreeing to pay back $8,250 he was accused of stealing from the tribal government. Shelly's public support of Snyder has clashed with his own tribal council, which voted 9-2 in April to formally oppose the nickname "Redskins." Shelly was accused of going behind the back of tribal leaders when he partnered with Dan Snyder's Original Americans Foundation (OAF) to host a golf tournament. When sponsors the National Indian Gaming Association and the Notah Begay III Foundation learned of the involvement of Snyder's foundation, they withdrew their support. "I think it is unfortunate the Navajo Nation administration of Ben Shelly is so out of step with the Navajo people, particularly, the young people, regarding this issue...I am also alarmed at the underhanded way this event was handled. The other funders were unaware of the Washington Redskins OAF involvement until the day before and Ben Shelly has repeatedly refused to comment on his meeting with Snyder."